Duart has been the home of the Macleans since Lachlan Lubanach Maclean, the 5th chief married Margaret, the daughter of the Lord of the Isles in 1360. Duart and the surrounding lands were her dowry. He built the keep on the outside of the existing courtyard walls and enclosed the well.During the following 200 years the range of buildings within the original courtyard, on the east and north sides, were completed. Sir Allan Maclean made the most recent alterations to these buildings in 1673, when he extended the north range. His crest, rather worn, is still above the door, his initials just discernible.From the sea room window, originally a 16th century gun emplacement, you can see at low tide, the rock where the 11th Chief put his wife, expecting her to drown. She had failed to produce an heir for Sir Lachlan. She was however, rescued by some fishermen and taken to her brother, the Earl of Argyll, at Invereray Castle. Sir Lachlan arrived to tell him of his sister's tragic death only to find his wife dining with her brother, the Earl!The Macleans were staunch royalists and fought for King Charles I throughout the Cromwellian war and again for the Stuarts in the risings of 1715 and 1745. 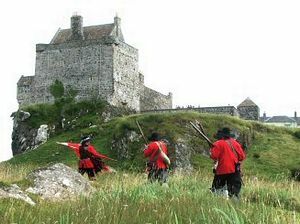 In 1688 Duart was attacked by English warships while the Chief, Sir John was fighting with his clan at the battle of Killiecrankie. His 10 year old son was taken to the Treshnish Isles for safety. (The snuff mull they both used is at Duart. )After this the Macleans lost Duart, and all their lands were forfeited in 1691. The castle, in a rather ruinous condition, was used as a garrison for a short time. The wives and children of these soldiers are buried in a small graveyard just beside the castle, specially consecrated for this purpose so that they would not be buried in 'unhallowed' ground.For over 150 years the castle was a ruin until Sir Fitzroy, 26th Chief purchased it in 1910. He engaged the architect, Sir John Burnett to restore the castle. Sir Fitzroy was nearly 70 when the repairs were finished just before the 1st world war. He lived at Duart for most of the time until his death in 1936 in his 101st year.Duart remains the family home of the Chief of the Clan Maclean. Duart is a 40 minute ferry ride from Oban to Craignure. The castle is 3½ miles from Craignure on the road to Iona. Or travel on the Duart Coach -tickets from Calmac in Oban.